To tackle our scientific objectives we are using multiple approaches spanning from systems to molecules and back (see pictures below). We integrate this information in computational models to analyze and predict brain function and changes. Besides that we enjoy being puzzled every day. We are probing the brain using in vivo imaging and electrophysiological methods to monitor the activity of single neurons and large neuronal populations. Ultimately the brain controls behavior and in converse learning changes the brain. We investigate this interaction by training animals and relating their performance and learning to the activity of specific cortical circuits. We develop systems to efficiently and automatically train and test large groups of mice (Francis et al. 2017). 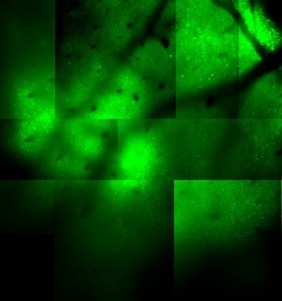 In vivo 2-photon calcium imaging: With this method we can image the activity of hundreds of neurons over large areas with single cell resolution (see image to right, every round spot is a neuron. This is an older image using synthetic dyes. We now use genetically encoded indicators). We are looking at cortical maps of stimulus features, how they develop and change (i.e. Bandyopadhyay et al 2010., Winkowski & Kanold 2013 , Winkowski et al. 2013, Meng et al. 2017) as well how they are modulated during behavior (Francis et al. 2018). Single and multi electrode electrophysiological recordings. We use these techniques to record where we cannot image: deep in the brain or to get information at high time resolution (Petrus et al. 2014, Wess et al. 2017). We use brain slices to study and dissect mesoscale circuits using patch clamp and imaging techniques coupled with laser-scanning photostimulation (LSPS) (i.e. Zhao et al., Viswanathan et al.). We utilize brain slices that contain the thalamus and the cortex to study the circuits that connect these structures. LSPS reveals that L2/3 of A1 contains cells with from at least 5 different functional classes based on their functional circuits. From Meng et al. 2017. We augment physiological studies by molecular and histological methods (In situ hybridizations, qPCR, immunohistochemistry, anterograde and retrograde tracers) to get a full picture of the developing brain. We integrate all the information we learned into realistic computational models. We implement these models in C++ or MATLAB and run them on PC’s/Macs, clusters, or iPhones.